Chris Nash continued his fine start to the season with a second consecutive half-century on the opening day of the Spesavers County Championship match against Somerset. Nash made 58 from 72 balls, with 10 fours, while Luke Wood, recalled from a short loan spell with Northants, was last out for 52. Lewis Gregory was the pick of the Somerset bowlers, with a six-wicket haul helping the visitors to maximum bowling points as Notts were bowled out for 263 in 66.4 overs. Stuart Broad then removed both Somerset openers as the visitors reached the close on 74 for three. Somerset backed up their decision to bowl first with the prized scalp of Ben Duckett in just the second over of the day. Having scored over 400 first class runs already this season Duckett fell lbw to Jack Brooks without a run on the board. Ben Slater and Chris Nash fought back with a stand of 51 but then the visitors struck twice in quick succession. Josh Davey replaced Brooks in the attack and had immediate success, clipping the outside edge of Slater’s bat for 24. Wicketkeeper Steve Davies barely had to move to take that catch but then had to dive a long way to his right to complete the dismissal of the in-form Joe Clarke for two, giving Gregory his first victim. Steven Mullaney played a punchy innings of 26, which included a pulled six off Brooks, before Gregory rattled him on the pads for the second leg before decision of the morning. The 26-year old bowler then claimed his third wicket of the match as Chris Nash picked out Jack Leach in the deep for 58. Nash had played fluently in reaching his 50 from only 60 balls but perished on the stroke of lunch to a catch in the deep by Jack Leach. 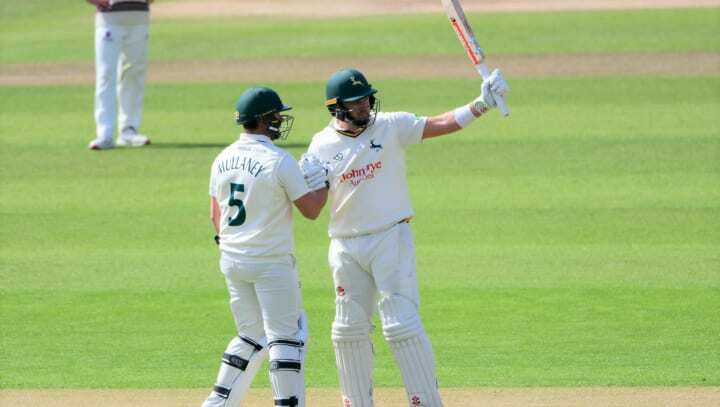 During the afternoon session Samit Patel and Tom Moores steered Notts towards calmer waters, taking the side from 119 for five to 177 for six, the point at which Gregory struck again, sending two of Patel’s stumps spiralling out of the ground in different directions. Patel had made 33 and Moores then went for 47, falling in a familiar manner in this fixture. In the match at this venue last September Craig Overton took a hat-trick, with all three victims falling to catches at second slip by Marcus Trescothick. The 43-year old again got in on the act – but needed two grabs before clutching the ball to his chest. Overton quickly followed up his first wicket with that of Broad, who played onto his stumps from a delivery that was angled down the leg side. Gregory polished off the innings by bowling Luke Fletcher to pick up the 11th five-wicket bag of his career, then added another with the dismissal of Wood. The left-hander had reached his half century from 63 balls then hoisted his next delivery high to Tom Abell in the covers. Nottinghamshire’s total of 263 began to look a little better as Broad found early rhythm and pace. Azhar Ali made 10 before umpire Steve O’Shaughnessy sent him on his way lbw. Trescothick resisted for almost an hour but couldn’t see off the England pace man, who found his outside edge from around the wicket. Broad’s opening nine over burst ended with figures of two for 12. James Hildreth missed out on the opportunity of repeating last season’s hundred here by obligingly tickling Fletcher’s opening loosener down the leg-side. Abell and George Bartlett prevented any further damage and ended the day with Somerset still trailing by 189 runs.